The third episode of ‘Zanui at Home with‘ has arrived! In this episode, we met Zoe & Benji Marshall, and their beautiful son, Fox. Benji Marshall is perhaps best known for his time with the NRL’s Wests Tigers, for whom he is the highest ever point scorer. Zoe, meanwhile, is an accomplished media personality in her own right, having worked across radio, digital, and print media for over a decade. As for Fox, well he may not be a star yet, but with a smile like his it’s only a matter of time! 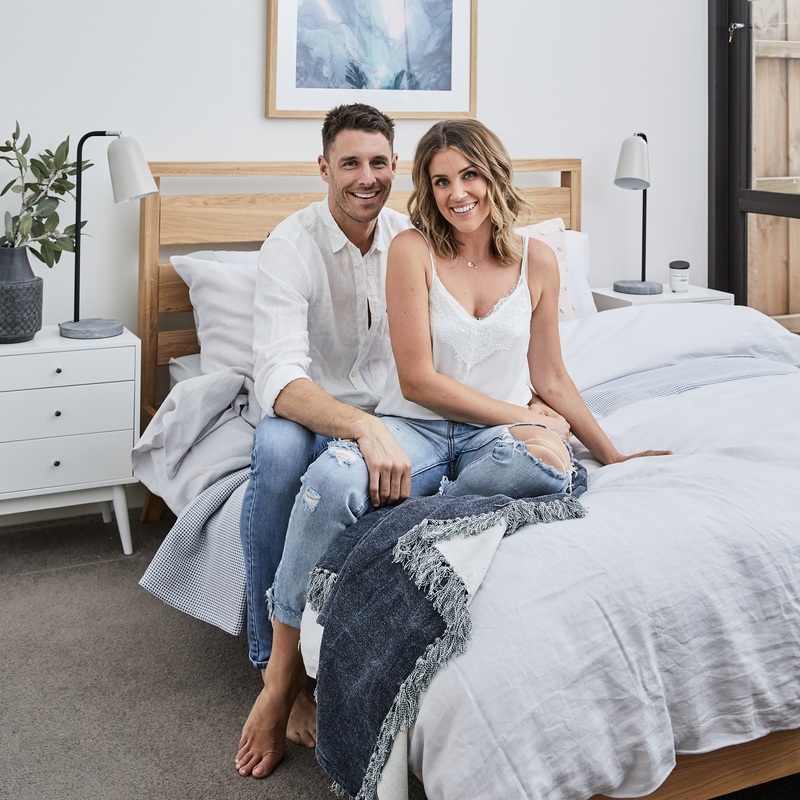 Together with our wonderful stylist, Jackie Brown, we completely restyled their outdoor spaces and Benji’s bedroom using products from Zanui. If you liked any of the pieces you saw, you can shop the whole look over at Zanui! 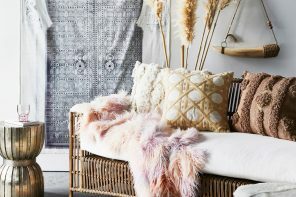 Jackie Brown is a Sydney-based freelance interior stylist. 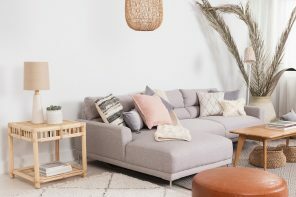 She’s designed and styled sets for some of Australia’s biggest lifestyle and interiors publications and worked for many large, commercial clients. She’s super excited to now be able to team up with us at Zanui to make some magic in the homes of some her (and our) favourite Aussie celebs! 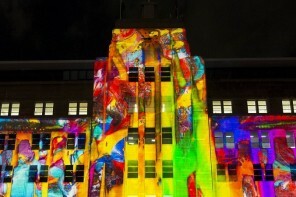 You can see more of her amazing work in her digital portfolio here. Of the makeover, Jackie (J) says there were some challenges at first. J: “Zoe and Benji didn’t really have a distinct style of their own, so what we nutted out together was the things that they liked, and some of the things that they didn’t like. 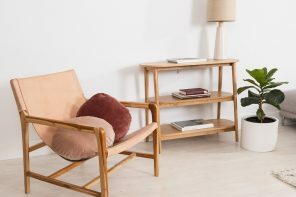 Shop the Helix Framed Canvas Print from Urban Road, the 100% Linen Sheet Set in slate from Vintage Design Homewares, the All Dock HybridX Compact Charging Station, Walnut from ALLDOCK, and the Seville Table Lamp from CAFE Lighting & Living online at Zanui. Jackie kept it clean and simple in Benji’s bedroom, with a consistent colour palette and minimal embellishments. Two pieces of wall art on opposite walls and a statement lamp on the bedside table give the space personality without it being too flashy. Jackie went for a largely monochromatic colour palette for Benji’s room, with lots of grey, charcoal, black, and neutral hues throughout. The palette can be lightened easily with some scatter cushions, a throw, or a simple change in bedding. 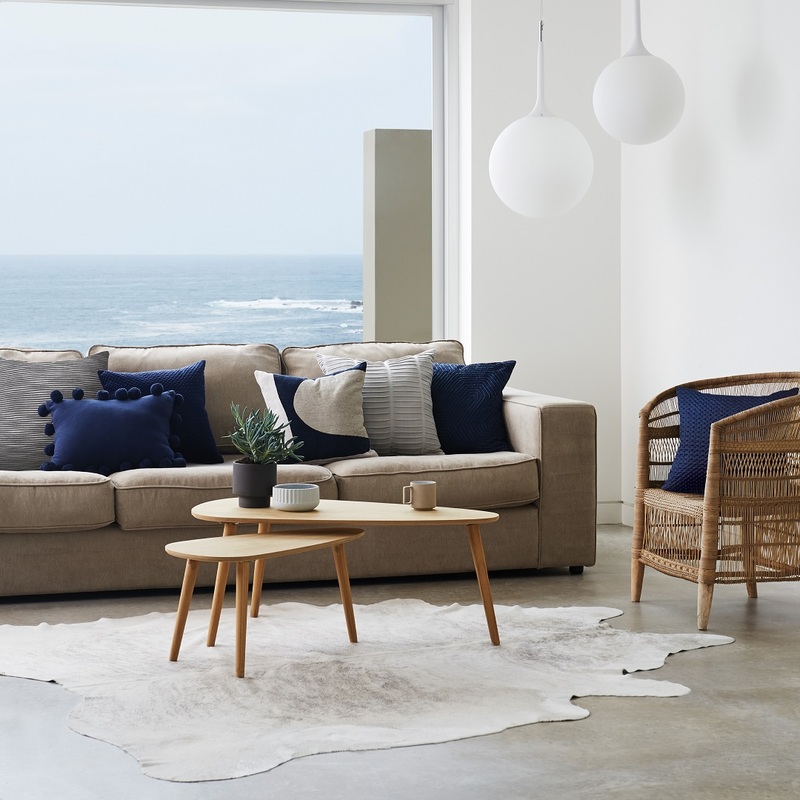 Shop the Abel Armchair, Linen from Zanui, the Ellipse Framed Canvas Print from Urban Road, the Vintage Linen Fringe Breakfast Cushion in smoke and the Vintage Linen Fringe Round Cushion in marshmallow from Aura by Tracie Ellis online now at Zanui. Speaking of the bedding, Jackie went with pure linen for Benji’s room. We’re talking linen sheets, a linen quilt cover, and linen pillow cases. Shop the Doux Linen Quilt Cover Set in white from Jenny Mclean, the 100% Linen Sheet Set in slate from Vintage Design Homewares, and the Vintage Linen Throw, Marshmallow from Aura by Tracie Ellis online now at Zanui. For those who love a clean, crisp bedding look, linen is perhaps not for you. While you can iron it out, linen has a tendency to wrinkle, but Jackie—and we at Zanui—believe this just adds to the beauty of the fabric. J: “There’s just something about the soft crinkle that makes you feel like diving in! Shop the Grace Slip Cover Bed Head in frost from Cornermill online at Zanui. One other key piece Jackie chose for this space was the bed head. A bed head can be a really low-fuss way to take your bedroom look to the next level. J: “This particular bed head was super easy to install. It was literally a matter of just sliding it in behind the bed! I love the element of luxury it adds to the room. 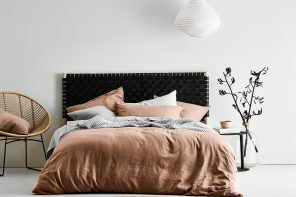 Not only do bed heads add an extra layer of style to your bedroom, they’re also very practical. 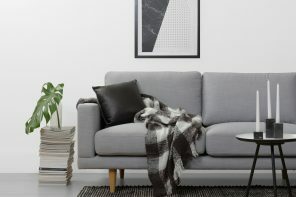 They provide a solid base to lean back against when you’re propped up on your bed pillows, so you’ll be much more comfortable as you tuck in to read a good book or watch a bit of telly before bedtime! They also stop your pillows from slipping down between the bed base and the wall, which is great if you’ve got an ensemble bed. 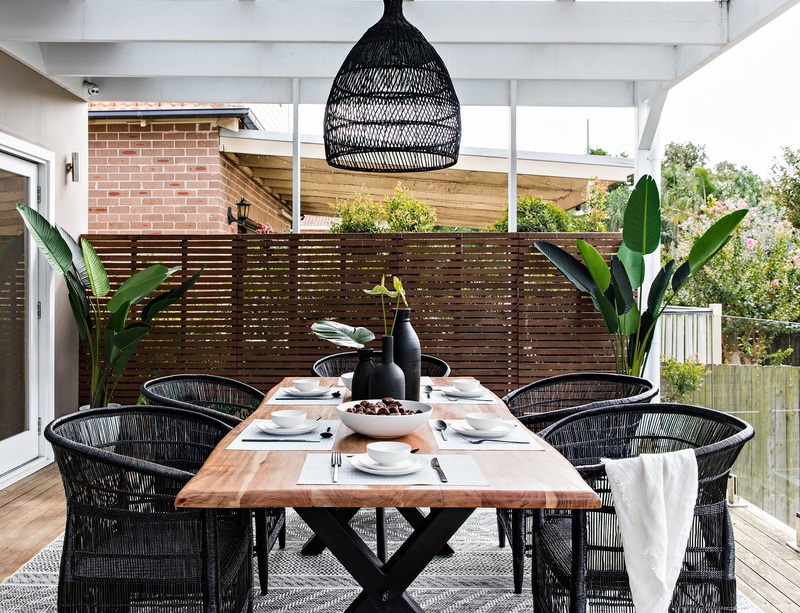 Shop the Malawi Armchair in black from Diello Designs, the Laguna Outdoor Dining Table from Nova Caeli, and the Tuki Pendant Light in black from Searles Homewares online now at Zanui. The outdoor space was the true standout for us in this episode of ‘Zanui at Home with’. 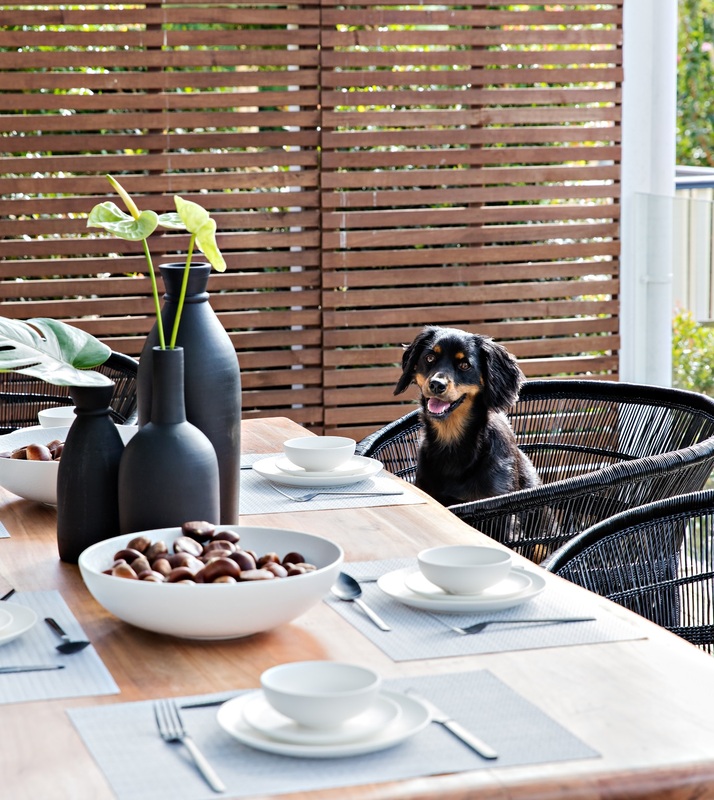 With a beautiful table, some comfy rattan chairs, a statement pendant, and a clever mix of textures, Jackie completely transformed Zoe & Benji’s back deck. This rug is quite oversized, which means the chairs can be pulled all the way out without catching on the ends of it—something to keep in mind if you’re considering a rug for your own dining space. You should also be cautious of your choice of rug material. 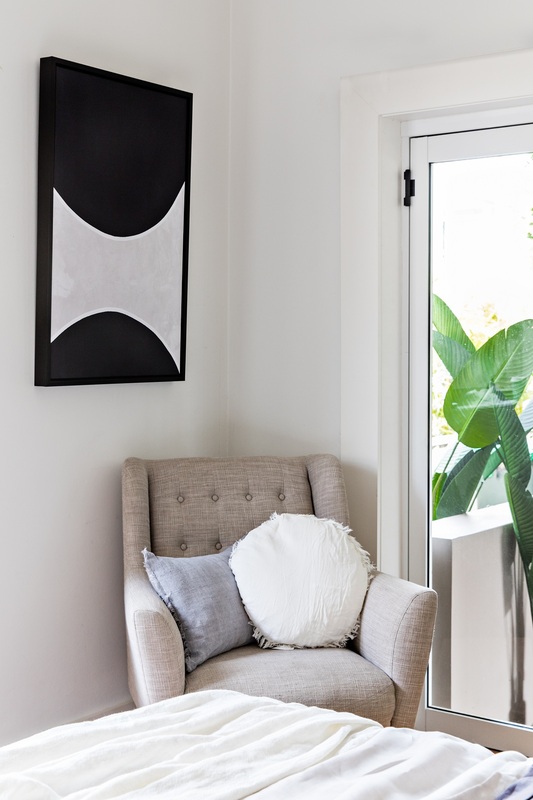 For this space, Jackie chose a rug made of enhanced polypropylene. This is a fantastic material for dining areas, both indoors and undercover outdoors. 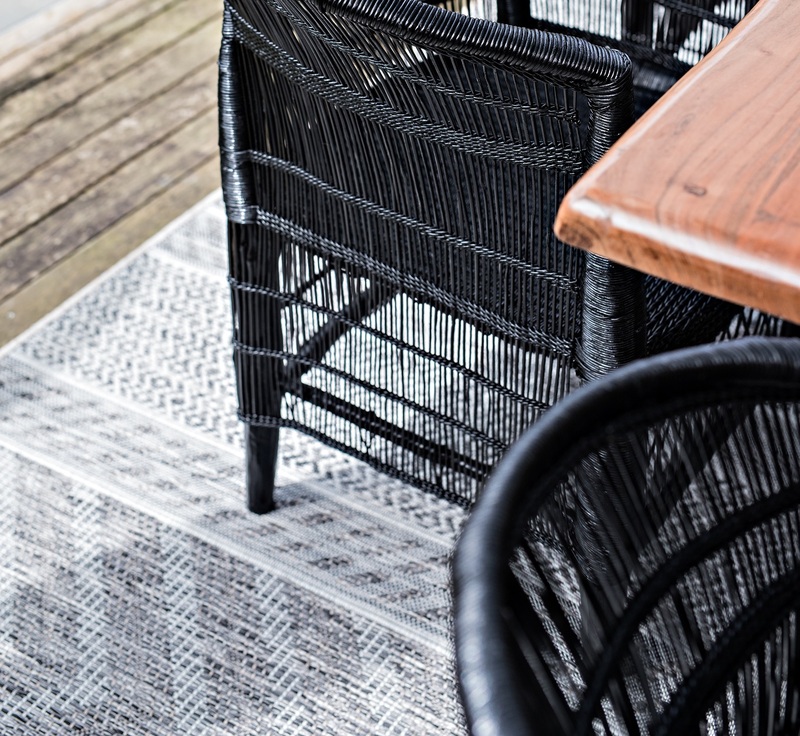 Shop the Elien Indoor/Outdoor Rug in charcoal from Rug Culture online now at Zanui. J: “It will hold its colour well, can be easily vacuumed, and is water-resistant, meaning it’s super easy to clean up liquid spills. In a home with two dogs, a baby, and a couple who like to entertain, it was a no-brainer! There are a lot of different textures in this space. 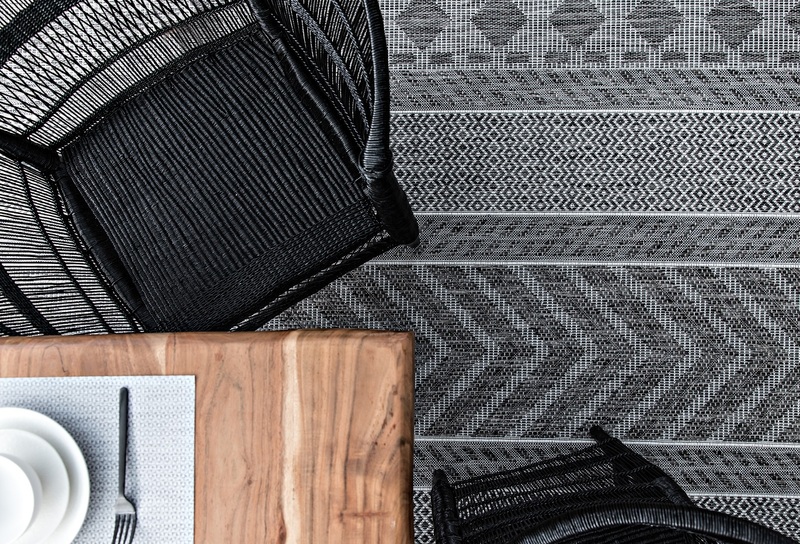 The rattan chairs, the timber tabletop, the raw ceramics, the matte black metal cutlery. 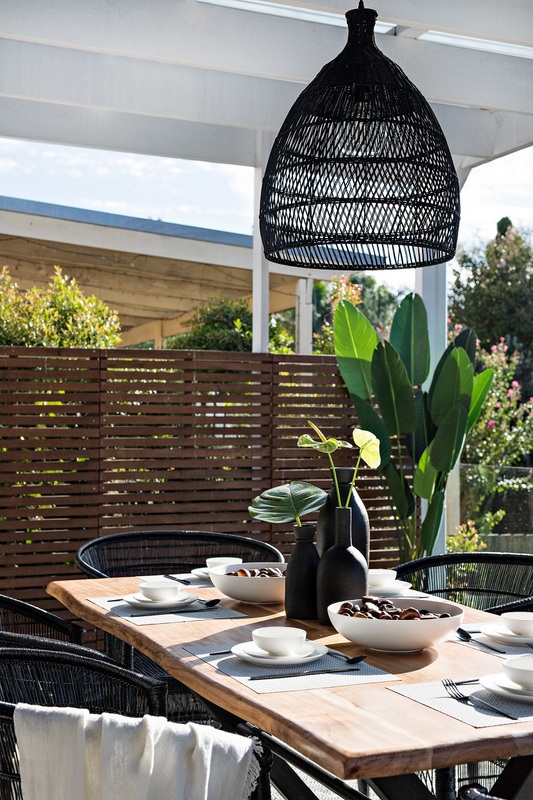 Each piece works in tandem to create this truly amazing outdoor dining area. While it can be a bit daunting to experiment with different textures, we can’t recommend it enough. Textures are what give a space personality. 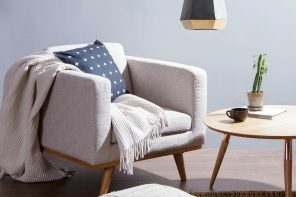 The right combination of textures can make a space feel much more inviting than it would if you stuck to just one, or used too many different ones. Thankfully, Jackie has some advice for those of us not all that confident in working with textures. The table setting is very clean and minimalist. It follows a classic black and white palette, which complements the pendant light, the rug, and the table legs. Jackie has a few handy tips for setting a table that wows as much as this one. 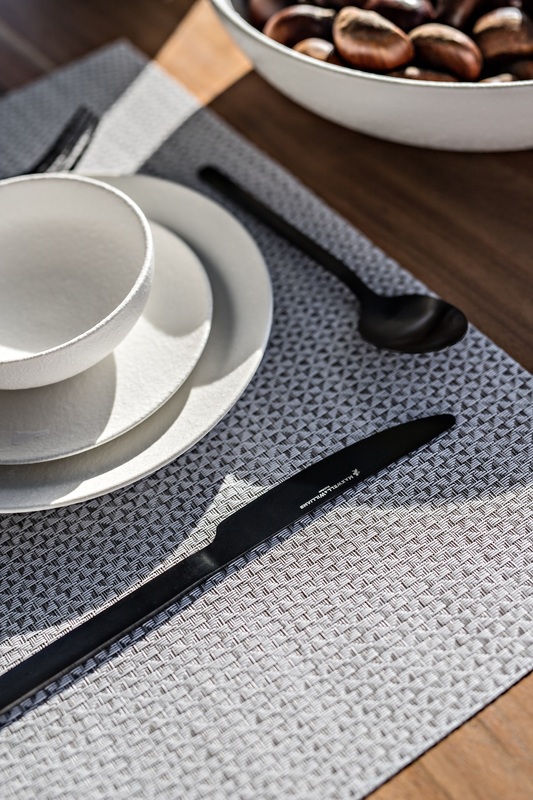 Shop the Elemental 16-Piece Cutlery Set, Pewter, the Diamonds Placemat, the Caviar Coupe Plate in 15 or 20cm, and the Caviar Coupe Bowl, 11cm, all from Maxwell & Williams, online at Zanui. J: “I always like to have my table set when guests arrive, and then take plates etc away just before I serve up in kitchen, before bringing them back to the table. There is something about seeing a fully laid-out table, complete with flowers or greenery, which takes a guest’s experience to a whole other level. 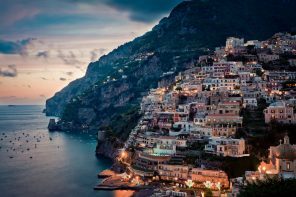 “A linen napkin tied or folded on the top plate, with perhaps a sprig of an herb you’ll use in the dishes you’re serving, also adds something really special to the table setting. Jackie freshened up the table setting with three pops of greenery at the centre, inside two kiln-fired vases. 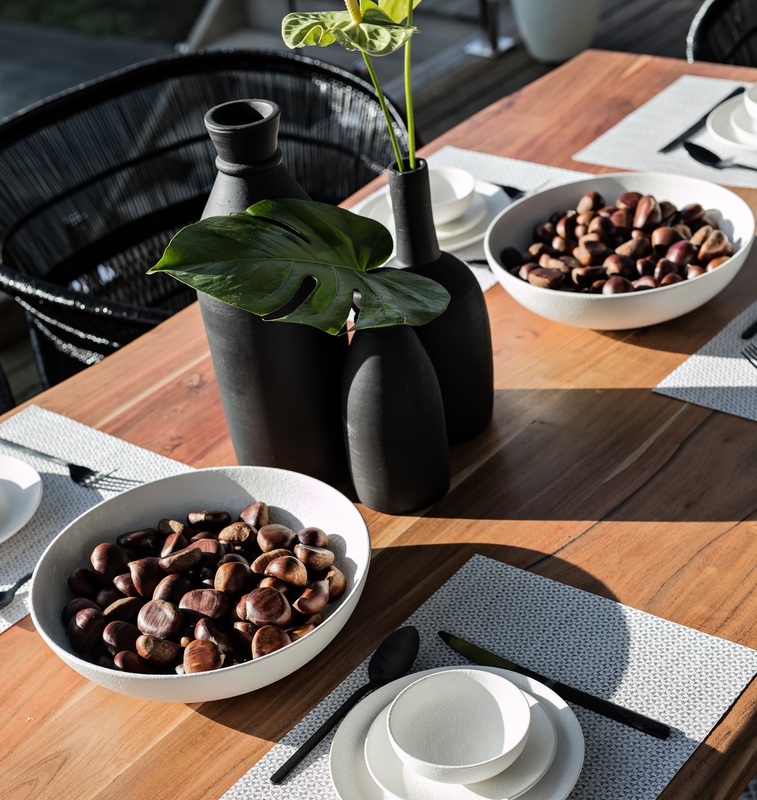 You may have also noticed the two large serving bowls filled with chestnuts, which really stand out atop the table. This is such a unique and interesting extra detail, which—despite being a relatively small feature—helped to tie the whole look of the dining area together. Jackie explained the reason she added these was simply to make the table setting feel a bit more wintry. 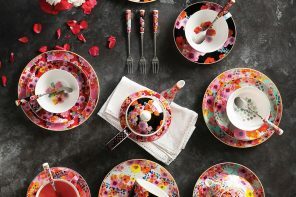 She recommends adding greenery or some kind of natural feature to your table setting, depending on the season. J: “Foliage is always a winner! When you have fresh flowers in the house, it always feels a bit indulgent and luxurious. 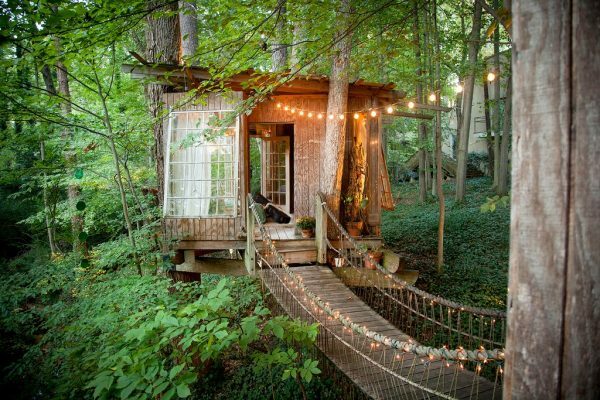 Same rules apply when styling up an outdoor setting, especially if you’re having guests around. That little bit extra will make them feel like VIPs! 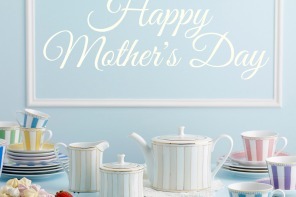 The best thing is, you don’t have to spend a fortune on fresh bouquets from the florist. You can just forage for a few leaves or twigs from your own garden, which won’t cost a thing. 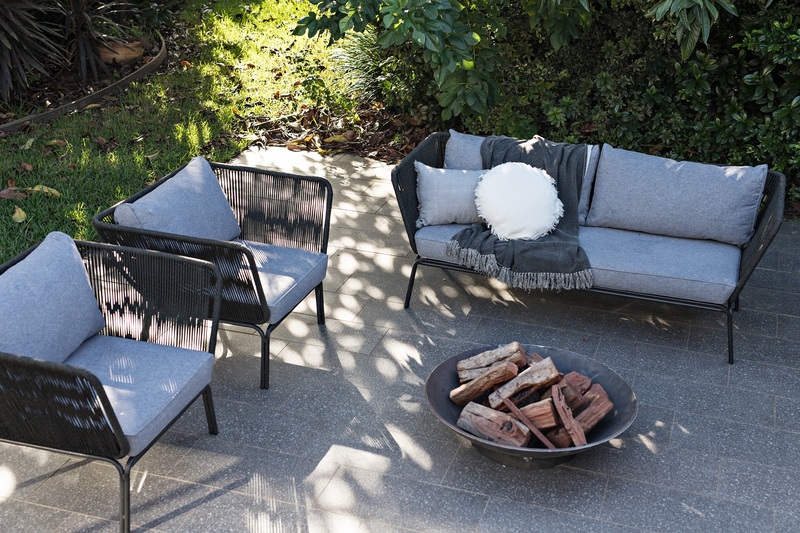 Shop the Rogelio 3 Seater Outdoor Sofa and Outdoor Armchairs from Vida & Co. online now at Zanui. Benji & Zoe remarked how they had never really utilised their paved backyard area, instead using it as a space to hang out washing! Now the space has become Benji’s favourite of the entire makeover. Jackie again kept it simple here, with just a sofa and two armchairs, to create an intimate and comfortable lounge setting. She also placed a fire pit at their centre. 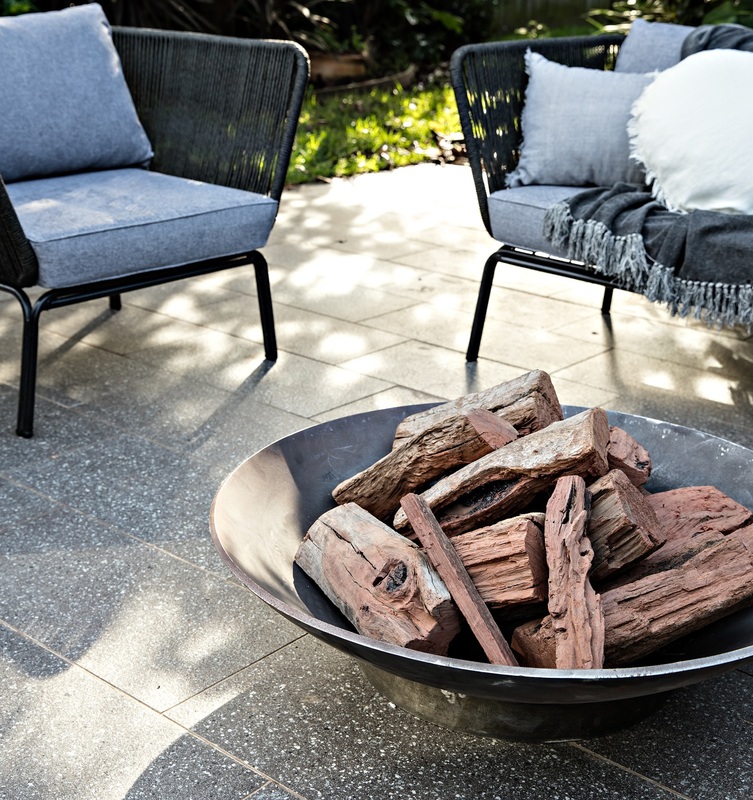 If you want to make use of your outdoor lounge space in colder weather, consider a fire pit! Shop the Angelina Outdoor Fire Pit, Medium from Robert Plumb online at Zanui. With all the greenery about, there’s plenty of shade and privacy, making it the perfect space for Benji & Zoe to chill out together on a balmy summer evening, or to entertain a few friends. Unlike the dining area, however, this lounge area is not undercover, which leaves the furniture exposed to the elements. Weather is, of course, a huge concern for anyone with an outdoor lounge space like this. J: “Outdoor furniture has to work really hard in Australia, especially in Sydney where it can end up being four seasons in one day! Did you enjoy what you read here? 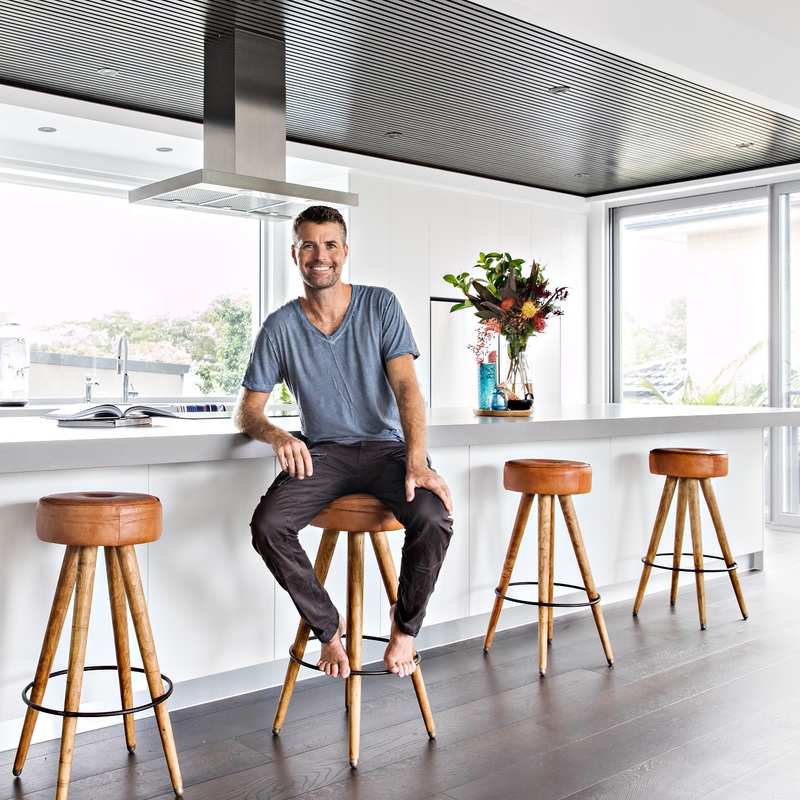 Then why not check out the earlier instalments of Behind the Style of Zanui at Home with Pete Evans and Georgia Love & Lee Elliott.